Captain Bob’s Pontoon fleet is comprised of outboard, four stroke engine pontoon boats. All boats are fully equipped with multiple cup holders, swim platforms, surround sound stereo systems and certified life vests. We have multiple sized boats to accommodate lots of summer getaway fun on Lake George. Some great places to visit all in a day’s time are Paradise Bay, Red Rock Bay, Black Mountain Point, The Narrows, Long Island, Dollar Island, Log Bay and Sandy Bay. Our apologies, boats are NOT pet-friendly so you must leave Fido on shore! Pontoon boats are available in-season only (early May until Columbus Day, season is weather permitting). See our rain policy here. Reservations can be made for half days (4 hours), full days (8 hours), multiple days or weekly rentals. Looking for the best day you’ve had since you can’t remember when? Call Captain Bob and look no further! 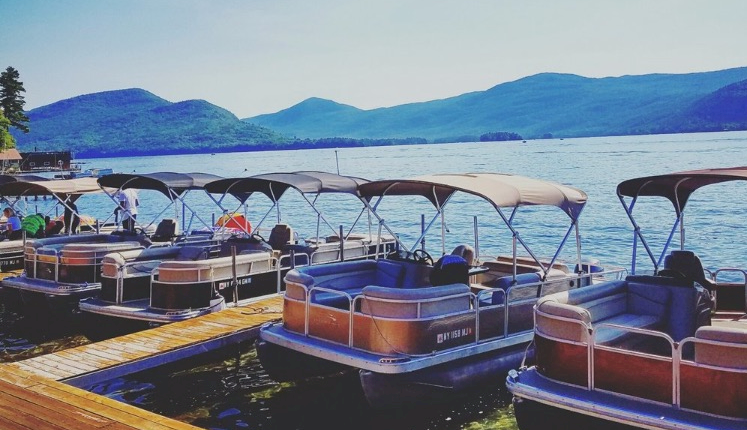 Take a cruise on Lake George in style on our luxurious Bennington pontoon boats with your family and friends. Both guests of the Contessa Resort as well as the general public can enjoy beautiful Lake George aboard one of Captain Bob’s famous 10, 12, 13 or 15 person pontoon boats. There is no better way to enjoy a hot summer day than cruising the lake on a boat with you and a bunch of your friends, swimming, tubing, just relaxing with some of your favorite tunes in the Adirondack sunshine. *6-Day Boat Rental: Is for Sunday AM to Friday PM Return Only. No Exceptions. **Available at 8am or 9am for 2 or 4 hours. If you’d like to rent during the afternoon please call for availability. Fantastic experience! Bob did a great job of covering all the bases and giving us a layout of all the islands. The staff was great to work with and we were able to get on our boat pretty quickly to enjoy our time! The staff was very friendly and there was an adorable dog running around that we couldn’t get enough of. Captain Bob’s his boats are well kept, large selection of sizes and his location is perfect!